This article is jam-packed and I have a ton to cover, so let’s get right to it! Two weekends ago, I was fortunate enough to go to Milwaukee, Wisconsin for the Grand Prix event with some good friends. We got up there Friday morning and immediately signed up for a draft and some Commander pods. I was surprised at how full the side events were during the entire weekend, especially on Saturday. For Insiders who missed the podcast Tarkan made with the CEO of ChannelFireball, Jon Saso, take a listen to it in the QS Discord—an important topic they cover is CFB’s focus on improving the experience for GP weekends, particularly by enhancing the appeal of the side events. While I won’t examine this in detail, I was extremely impressed by their commitment to this aspect of the Grand Prix. I can personally say it made a huge difference in how I approached the GP. I planned to drive up (from Chicago) just to get my Mythic Edition allocations, but because of the side events decided to stay the weekend and play a ton of Magic. I had a great time at the GP, and I highly recommend checking one out if you haven’t. In my personal opinion, a GP is a bit intimidating to go to alone, but if you have even one other friend willing to make the trip with you, do it. It is truly a great time, and there really is no better setting where I can imagine playing tons of Magic than at one of these events. Mythic Edition: Sell or Hold? Guilds of Ravnica: Mythic Edition has been an intriguing and unique product for collectors, financiers, and players alike. Hasbro set the MSRP higher than most of its Magic products as a test to see how the market would respond, and the supply was quickly absorbed. The MSRP of $249.99 plus tax and shipping was a remarkable entry price for those who got them from Hasbro, as sealed boxes were selling for $600 in the early days after launch (in October). Prices on sealed Mythic Edition have since stabilized between $475 and $500, nearly double the original MSRP. They are currently experiencing downward pressure as more product enters the market via the remaining GP allocations in 2018. I was fortunate enough to land a few boxes from the GP and another from Hasbro’s website. With the downward pressure on prices, I stopped myself from listing them immediately to make sure I could maximize value. I didn’t want to be caught in a race to the bottom on sealed boxes, especially considering more will be entering the market every weekend a GP occurs from here until the end of 2018. First, I have to decide if I want to sit on multiple boxes of inventory (remember, each one held in inventory represents about $270 in stagnant cash flow). The answer to this question is a resounding “no.” I generally like to be churning and burning profits. The second step is to determine the value of cracking and selling as singles versus selling the box sealed. This step is tricky as it involves a calculation of Expected Value on the 24 packs worth of Guilds of Ravnica cards, plus the actual value of the eight Mythic Edition planeswalkers and their emblems. It also involves an opportunity-cost evaluation if I were to hold the product, as that would eat into my available cash flow for future acquisitions. The easiest part of the equation is to find out the value of the eight planewalkers and emblems. Based on TCG low, this comes out to roughly $525 as of 11/26, before fees and shipping. 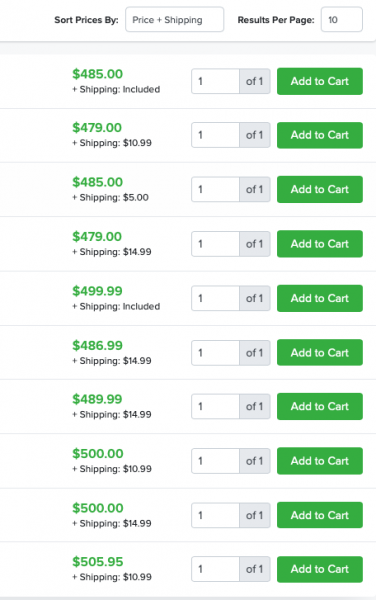 Wait a second… $525 before fees and shipping!? Yes, you are reading that right. If you sold every walker and emblem at TCG low from your Mythic Edition box right now, you can net about $525 before the expenses are factored in. Keep in mind you will incur an extra $0.30 cost for each sale due to the credit card fees. Plus the individual shipping costs will be significantly higher (as you will likely want to track most of the walkers due to their value). Below is a visual of the listing as of 11/26 on TCGplayer for Mythic Edition sealed. If you multiply the middle listing of $499.99 by .1275 for the base TCG selling fee, and subtract $6.70 for flat-rate tracking, you get $429.25. Eerily, this is less than a $0.20 difference from selling the Mythic Edition singles. For anyone who acquired boxes from Hasbro or a GP, this feels like the right approach to maximize your value. With just a little luck, those additional 24 packs worth of GRN cards can add another $20-40 in value to your box. If nothing else, you are playing with house money by opening them. I didn’t need any additional convincing after I saw how much the individual Mythic Edition cards were selling for. I decided to crack the boxes open and leave the Mythic Edition packs sealed, until an individual card sells. This lets me maximize my opportunity to sell Guilds of Ravnica cards still propped up by the Standard meta. (Note: there are ten uncommons that can currently be sold for $0.25 or more in Guilds of Ravnica). I don’t want to miss out on the extra value these boxes are creating for me, and my hypothesis is that some cards from Guilds of Ravnica will start to drop once Ravnica Allegiance spoilers start. If sealed Mythic Editions shift in value by $100, then my above analysis and decision would change. To reflect that, I have only opened two of my three boxes so far, just in case. As it is, I actually think any sealed Mythic Edition boxes found around $450 make for a pretty solid, low-risk spec target. 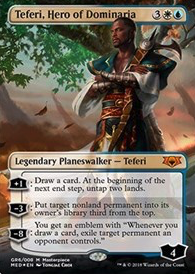 It is worth mentioning that Mythic Edition Teferi, Hero of Dominaria is down to six copies on TCG as of this writing. The price has jumped from roughly $130 at its lows to $160+, likely sparked by the 15% kickbacks. If you have one to sell, I recommend keeping a close eye on this stock through December. I am predicting the supply will evaporate by spring 2019, and then these should jump over the $200 threshold. I have also noticed recent fluctuations with Ral, Izzet Viceroy and Tezzeret, Agent of Bolas. Ral has started to see a sprinkle of play in Eternal formats and will likely make its way into Niv-Mizzet, Parun Commander builds. Tezzeret is a casual favorite and also sees fringe play in Modern and Legacy. The key to both of these is that they are priced middle-of-the-pack compared to their peers. Thus I believe they are still affordable enough for players to be attracted to them. My mention of Ral, Izzet Viceroy and Niv-Mizzet, Parun above is a perfect segue to introduce a new section I will be doing to end some of my articles moving forward. I am titling it Chris’s Commander Corner because frankly the alliteration is too good to pass up, but also because I love talking about the format. While I was at GP Milwaukee, some EDH players saw me pull a Niv-Mizzet, Parun and they immediately asked if I was going to build a deck around it. I was a bit surprised by the question because Niv struck me as a force in Standard, not as a prospective commander. I began pulling other Izzet cards in my GRN drafts and talking to others (notably one of my friends, Brian, who has a great feel for EDH) about the prospect of Niv as a commander. Now I realize he has real potential to be both fun and powerful (and he has a huge casual following). Later on Friday, I looked at Niv on EDHREC and started filling my carts up with targets for a potential EDH deck. By the time Sunday rolled around, most of the cards I had added to my TCG cart were in my “save for later” section because others had purchased the copies I added. In subsequent days, I started tracking this closely and found that Niv was causing tons of cards to move without anyone really noticing because they weren’t appearing on the MTG Stocks “Interests” page. By Monday, I decided not only that I would build a Niv EDH deck, but that I would also take a shot on some specs in case “Niv-Mania” becomes a thing! Arjun, the Shifting Flame is the classic case of a single- (and low-) print card that never had a real EDH home before Niv-Mizzet, Parun. The ability to cycle a hand into a library is unique, but not that useful for the average EDH player looking for consistency. In a Niv build, though, the text “draw that many cards” is extremely powerful because each draw counts as a damage trigger. Arjun should be an auto-include for every Niv player out there. The stock has dropped from six pages on TCG, when I first started tracking it, to two at the time of this writing. My target entry point on Arjun, the Shifting Flame was sub-$2, with an exit forming between $6-8 and highs hitting $10. If you’re an Insider, hopefully you heard about this on the Discord and were able to take advantage! Here is another card which has seen its stock drop to five pages at the time of writing (down from eight when I first started tracking it). The nonfoils are a great budget option for those looking to simply build a Niv-Mizzet, Parun EDH deck. But the foils are in dwindling supply and would absorb quickly if “Niv-mania” picks up. This spec doubles as a Wizard, and thus it already has a home, which is eating into the supply and propping its price up some. My investment plan for Docent of Perfection foils is to target an entry under $3 (for NM) and exit at $8-10, with buylists for credit also being an attractive exit. This is another spec I mentioned several days in advance in the Discord. I called Bösium Strip out on Twitter about a week ago as a Reserved List target that should see an uptick in usage in the spellslinger-style Niv builds. The Near Mint stock has resupplied around $4, up from $2 just a little over a week ago. There are still some deals to be had, including a $1.99 NM copy on Card Kingdom at the time of this writing. I love the Reserved List, so any card with a remote chance of playability will catch my eye and make it into Chris’s Commander Corner. My entry-point on Bösium Strip was $1.79 (NM) and I am targeting an exit at $5-6. Although I may hold a couple of copies for longer-term appreciation because of the Reserved List designation. I encourage everyone to try a Grand Prix event out if you have the opportunity. For those of you with a Guilds of Ravnica: Mythic Edition, I encourage you to consider selling the box as singles and taking advantage of the cheap GRN packs it nets you, at least until the sealed prices catch up. For those of you considering an acquisition of Guilds of Ravnica: Mythic Edition, the window on supply entering the market ends with 2018. So keep an eye out for the floor and try to get the ones you need by Spring 2019. After that, I suspect each of them could appreciate—some more significantly than others. As for Chris’s Commander Corner, keep an eye and ear out for Niv-Mizzet, Parun in EDH. There are plenty of additional targets ripe for speccing if Niv-mania really does take off. Don’t forget: you can find me on Twitter (@ChiStyleGaming) or on QS Discord. See you on the battlefield!